Selected for J.P. Morgan's 2018 Holiday Reading List Imagine your life without the internet. Without phones. Without television. Without sprawling cities. Without the freedom to continue working and playing after the sun goes down. Electricity is at the core of all modern life. It has transformed our society more than any other technology. Yet, no book offers a comprehensive history about this technological marvel. 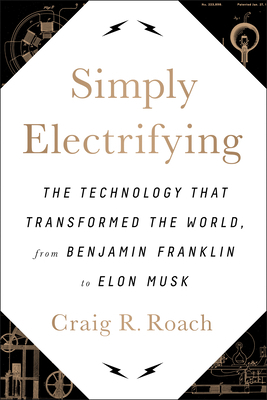 Simply Electrifying: The Technology that Transformed the World, from Benjamin Franklin to Elon Musk brings to life the 250-year history of electricity through the stories of the men and women who used it to transform our world: Benjamin Franklin, James Watt, Michael Faraday, Samuel F.B. Morse, Thomas Edison, Samuel Insull, Albert Einstein, Rachel Carson, Elon Musk, and more. In the process, it reveals for the first time the complete, thrilling, and often-dangerous story of electricity's historic discovery, development, and worldwide application. Electricity plays a fundamental role not only in our everyday lives but in history's most pivotal events, from global climate change and the push for wind- and solar-generated electricity to Japan's nuclear accident at Fukushima and Iran's pursuit of nuclear weapons. Written by electricity expert and four-decade veteran of the industry Craig R. Roach, Simply Electrifying marshals, in fascinating narrative detail, the full range of factors that shaped the electricity business over time--science, technology, law, politics, government regulation, economics, business strategy, and culture--before looking forward toward the exhilarating prospects for electricity generation and use that will shape our future. Dr. Craig Robert Roach is a nationally recognized expert on the electricity business. Over the course of his forty-year career, Dr. Roach has been vetted and accepted officially as an expert in regulatory courts and courts of law across North America. He has served in cases involving one of the biggest bankruptcies ever, a first-of-a-kind clean coal investment, a federal preemption case resolved ultimately by the Supreme Court, and the design and implementation of electricity auctions worth billions of dollars. What sets Dr. Roach apart is that he brings both top academic credentials and hard-won, hands-on practical knowledge of the electricity business to Simply Electrifying. He earned his Ph.D. in Economics from the University of Wisconsin, consistently ranked among the top ten research institutions in economics in America. He is the founder and President of Boston Pacific Company, Inc., a consultancy specialized in the electricity business. He and his firm have become trusted advisors to regulators as well as electric utilities and investors. Dr. Roach brings to Simply Electrifying a reputation for an objective and unbiased eye for the evidence--and a commitment to honestly balance the evidence from all sides.